Syndicate Bank and Canara Bank the two progressive banks took the initiative in mitigating the unemployment problem under the leadership of Padmabhushana Dr. D.VeerendraHeggade, a great visionary and religious head of the famous pilgrim center Dharmasthala in Karnataka. 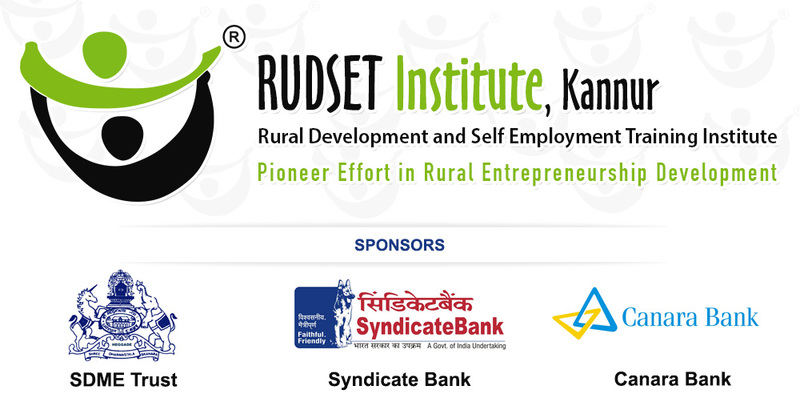 The collective thinking gave concrete shape in providing an institutional framework, in the form of Rural Development and Self Employment Training Institute (RUDSETI) in 1982 at Ujire, a small village in Dhakshina Kannada district of Karnataka.Encouraged by the success of Ujire experiment, RUDSETI has now established 27 units spread over 17 states in India. About RUDSET Institute, Kannur RUDSET Institute, Kannur – the only RUDSET Institute in Kerala was originally established in the year 1985 at Maipady in Kasaragod district, catering to the needs of the unemployed youth in Kasaragod, Kannur , Mahe and Wayanad district. In 1994 the Institute shifted to a rented building atKannapuram. In the year 2011 the institute has shifted to own campus at Kanhirangad, Near Taliparamba. The same was inaugurated on 6th January 2012 by Sri KC Joseph, Hon’ble Minister for Rural Development, Govt of Kerala. The present building is the result of financial support given by Ministry of Rural Development [MORD], Govt of India and our sponsors. The Institute is currently managed by Sri. PV Surendran, Senior Manager on deputation as Director from sponsor organization, Canara Bank.The functioning of our Institute is monitored by a Local Advisory Committee, chaired by Deputy General Manager, Canara Bank, Circle Office, Calicut consisting of eminent personalities from Govt. departments, NABARD as well as from sponsor banks as members. The Committee, periodically review the performance and assist in achieving the progress and better performance of the Institute. Channellising youth power for wealth creation. Empower youth to share economic progress equitably. PHILOSOPHY Transformation of rural youth to acquire productive identity through short duration intervention. This is achieved by bringing technology, training and credit within their reach, utilizing little experience gained in their life. Identify, orient, motivate, train and assist the rural youth to take up self-employment ventures as an alternative career. The Board of Governors consisting chief executives of sponsor organizations is the supreme policy making body. The “Governing Council” with ‘Executive Director’, an officer deputed by sponsor banks aids ‘The Board of Governors’ in monitoring RUDSETI. Dr. D.VeerendraHeggade, President of ‘Shri. DharmasthalaManjunatheshwara Education Trust’ is the President of the ‘ Board of Governors’ as well as ‘Governing Council’. Change the line like this ‘ Each RUDSETI has an Advisory Committee under the chairmanship of District Collector named ‘District Level RSETI Advisory Committee’ [DLRAC] with representatives of sponsor organizations, Government Officials and eminent personalities.